Do you agree with the idea that there is a right tool for every job? If so, and if you are a tow truck operator, you probably have an extensive collection of chains, hooks, and tiedown straps on your truck. Do you have side mount wheel nets complete with hooks and ratchets? If not, you probably need some to make hauling easier. These are great tools for securing vehicles prior to transport. We offer several variations of side mount wheel nets in different configurations. We recommend purchasing them either in pairs or lots of four so that you never find yourself one short. If you have never used one of these nets before, we suspect you’ll be a convert the minute you do. They make the job of towing easier and faster than it has ever been before. At the top of the list is the speed at which you can deploy wheel nets. You simply place the loop of the net over the top of the tire and then work it down along the sides until it’s about one-third of the way down. At this point the loop should be completely encircling the top third of the tire. Next, you use the included hook to secure the strap to your flatbed or tow bar, then deploy the ratchet to tighten it down. With a little practice, you can do this in under a minute. As a side note, the net should always be placed over the tire with the ring facing the rear of the vehicle. That way, the vehicle is pulled forward as you winch down. There is no doubt that chains are pretty durable. But guess what? So is the webbing material used to make wheel nets. You will get plenty of years of reliable service from your nets as long as you take care of them. They stand up well to temperature extremes, precipitation, snow and ice, road debris, and so much more. 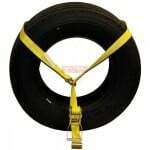 While chains may be just as durable as side mount wheel nets, they are not as flexible. There are a lot of sensitive parts on the underside of a car, and you have to be very careful when you’re using chains. Wheel nets are a lot less risky because of their flexibility. They are easier to deploy without damaging anything underneath, and the webbing material itself will never scratch the finish of a car. You still have to be careful with hooks and ratchets. Last but not least is cost. 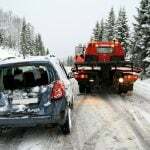 While every tow truck should be equipped with an adequate number of chains, buying chains can get expensive. Wheel nets are a lot more cost-effective. For less than the cost of a good meal at a four-star restaurant, you can purchase a high-quality wheel net more than capable of doing the job. Save your expensive chains for those tough jobs when they absolutely have to be used. For the rest of your jobs, use side mount wheel nets instead. You will spend less money without sacrificing the integrity of your work. Mytee Products is proud to serve America’s tow truck operators with a full range of towing equipment and supplies. In addition to side mount wheel nets, we carry a complete range of tiedown straps, hooks, chains, winches, ratchets, and towing lights. Everything you need to fully outfit your truck is available here.